... And I'm totally taking that as a compliment. So, remember how I started a huge hand-quilting project last spring and then abandoned it because it got too hot? Yeah, logic. I picked it up again a few weeks ago and was determined to finish it this time. 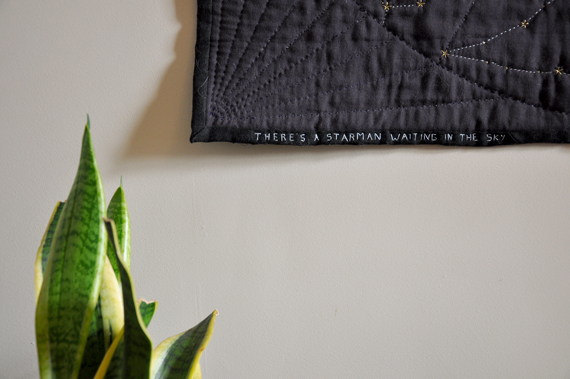 My boyfriend and I have been slowly filling our walls with pretty things but I kept reserving this one particular piece of wall for this quilt. Now it's up there! Woohoo! 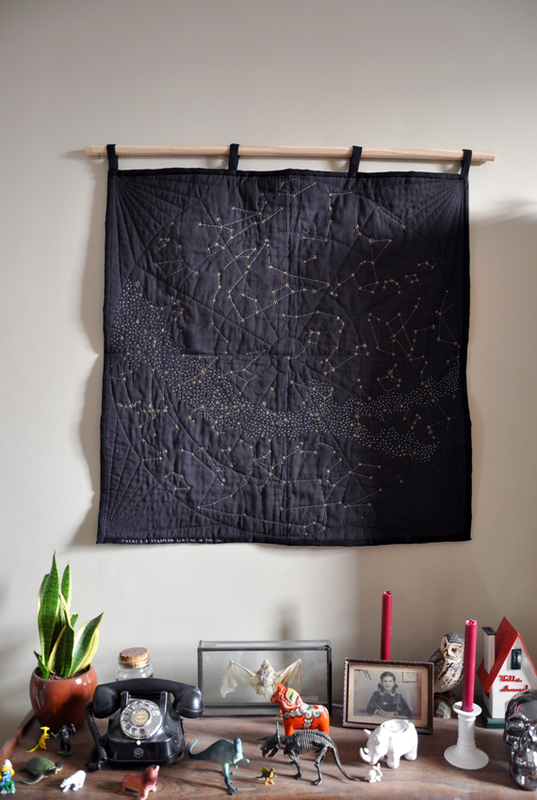 This is the small constellation quilt kit by Haptic Lab. They have released a large version since this one, but the sheer size of that thing makes me want to lie down. This one already took ages! But fun ages. And with a very satisfying result. 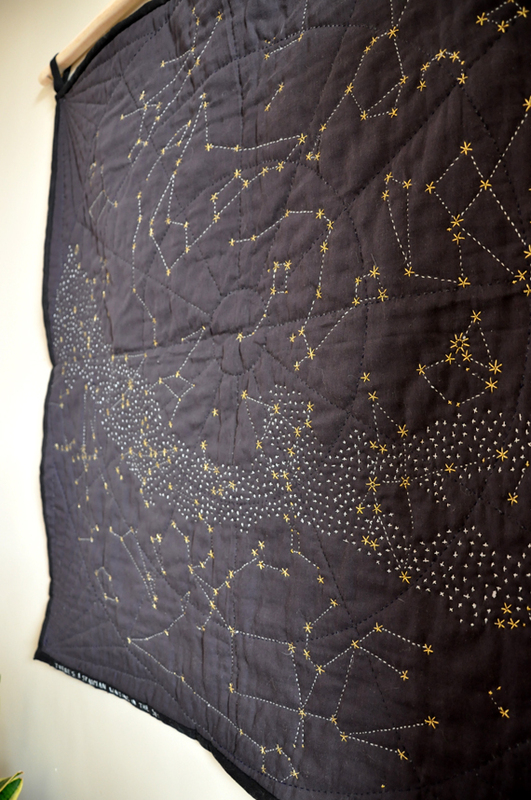 The basic idea is super simple: the quilt template has been printed on a kind of tear-away stabilizer. All you have to do is layer your fabric and batting layers, baste the template on top and go to town. Since this was always destined to be a wall hanging (fancy blankets are a no-no if you have a cat with claws he likes to use) I didn't bother to make the back of it look nice. So no pictures of that, haha! The top fabric is a lovely soft double gauze, and it's backed in a dark blue cotton. 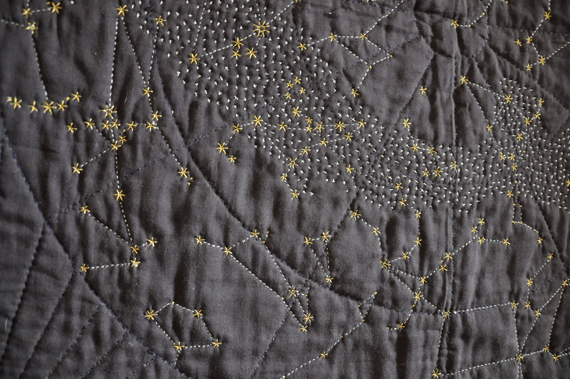 I used four colours of embroidery thread for the quilting: dark blue and light grey for the map lines and dashed lines between the stars, and two colours of metallic thread for the stars and milky way. Metallic thread can be a bit tricky to work with since it frays and splits like crazy, so here are a few things I found helped: an embroidery needle with a larger eye so there's not as much stress on the thread and shorter lengths of thread than you'd usually take. I didn't have enough fabric left to do matching binding, so I used some black linen from my stash. I made hanging loops from the same linen and just handstitched them to the back. The stick is a broomstick with a bit sawed off. I used this tutorial for the binding and it worked like a charm! I also added a little bit of extra embroidery after the sad events of last week. It seemed fitting. Both the boyfriend and me love the outcome, and I've been eyeing the World Map... Even though another project like this might give me even more grey hairs. Encouraged by this success I immediately embarked on another decorating project: more personalised IKEA furniture! I painted a little side table last year and loved the result, so when we were thinking about putting a little chest of drawers next to our front door to keep hats, scarves, keys and all the other junk that just ended up on our dinner table I decided to go that route again. I dragged this thing home one day (along with a shark) and got painting earlier this week. 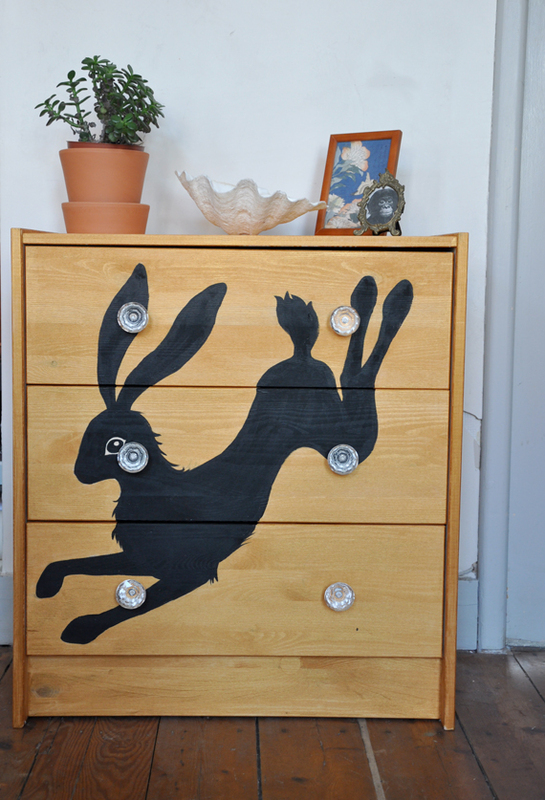 The base colour is a lovely gold that has a really subtle shine in the daylight, and I added a big running hare because I could! 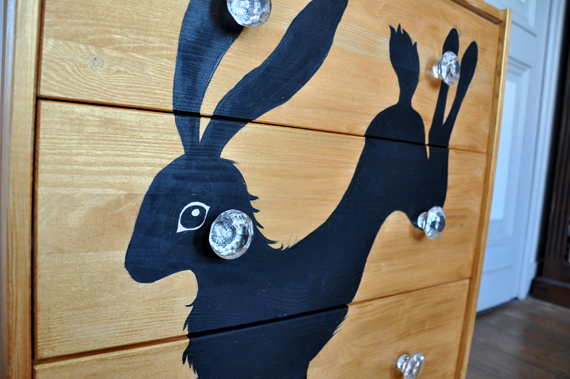 At first I had painted the original wooden knobs black but it looked a bit cheap, so I switched them for these cut glass knobs. Wayyyy better! I'm really happy with how this turned out, and so is the boyfriend! It suits our appartment pretty well. I'll be back soon with some sewing! There's an Inkodye workshop at Pauwels Stoffen next week and I'm already excited about the possibilities!